Hello friends! This past week I was busy living life, instead of blogging about it. Ready to be back at this week though! The bump pops out one day and is back in another. I can't wait for a big belly! Total Weight Gain: 4 lbs. Symptoms: A little bit of nausea & exhaustion still, but seems to be improving each week. Some days are definitely better than others, but the good are outweighing the bad. 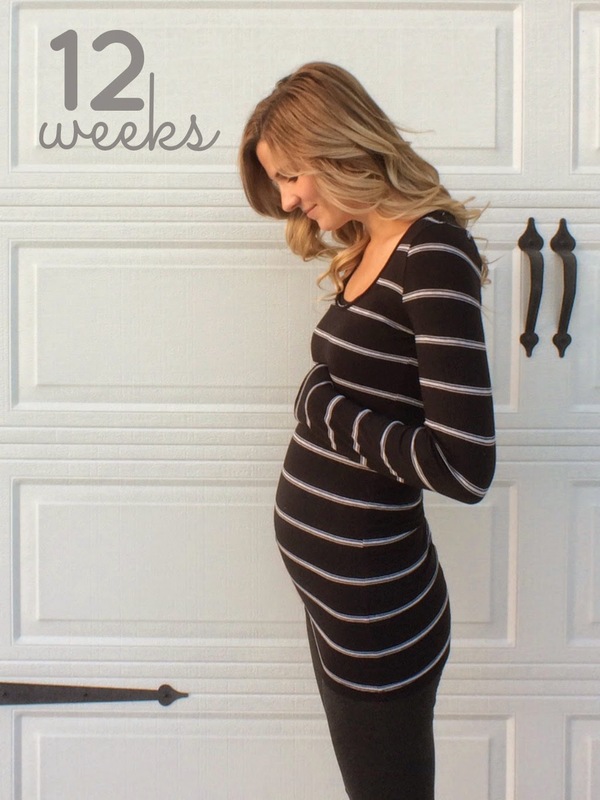 Gender Predictions: I'm feeling pretty neutral this week, but Liam mentioned a baby sister... I go to the midwife on Tuesday and am hoping to schedule our ultrasound, so hopefully we will know the gender sometime in late november! Maternity Clothes: Not wearing them yet, but I did make a few purchases this weekend at the GAP sale. I am particularly loving these tanks. Sleep? One night with some pretty serious insomnia & lots of night waking in general. I think my body is still adjusting to Liam actually sleeping for some decent stretches and not waking every 2 hours. I would really like to sleep through the night just once before we have a newborn on our hands! Miss Anything? My clear skin! I generally have great skin, but pregnancy is not so good to be in this area. I am open to any and all suggestions for face wash that will help! Please share your favs! Food Cravings/Aversions: Fruit seems to be the consistent thing. Smoothies are my go to when I can't even think of eating a meal. And the season of satsumas (or cuties) is upon us, and I'm eating about a costco bag a week right now. Staying Active? With Conor out of town and my parents visiting this week, I wan't all that active. I managed in only two workouts. There is definitely room for improvement here! Nursery Progress: As I said, we won't be changing things over from playroom to nursery 'til after Christmas, but I'm still thinking of ideas. The room is actually quite terrible, with not one single bare wall. There are odd windows and closets and nooks, and then a random door straight to the bathroom that is unneeded and really just a nuisance. We are going to get in touch with a contractor and see how easy it would be to remove the door and dry wall over it! Cries: No. However, moody....yes! Conor just loves it, let me tell you! Liam's Thoughts: He is just a little chatterbox when it comes to the baby. He pats & kisses my belly constantly. I think he is genuinely really excited for a baby to join our family! Looking Forward to: My midwife appt. I just love checking up on the baby! I definitely don't miss the nauseau! Glad to hear you still like fruit smoothies though... What a life saver! Super lame about the skin. When I went back on birth control my skin was heinous. Very annoying. So sympathy but no solution sorry!